I was looking for a 'formal' definition of 'SOA Security Gateway'. Failing to find such [yes, not even in Wikipedia] let's try to build one.. Message Interceptor Gateway pattern is the one that directly comes in to my mind.. We have implemented this at many customers with WSO2 product stack.. ESB, IS, GReg and WSAS/DSS. This pattern provides a single entry point and allows centralization of security enforcement for incoming and outgoing messages. The security tasks include creating, modifying, and administering security policies for sending and receiving SOAP messages. It helps to apply transport-level and message-level security mechanisms required for securely communicating with a Web services endpoint. Isn't this the functionality we are looking from a Security Gateway..? BTW, if you are building a Security Gateway, you can't ignore OWASP XML Security Gateway Evaluation Criteria project. The OWASP XML Security Gateway Evaluation Criteria Project (XSGEC) defines an open standard for evaluating XML Security Gateways, such as those used to protect and provide security services for Web services applications. This project categorizes the evaluation criteria in to 9 sections. The authentication section describes the support at the service level and message level for inbound and outbound communication to the Security Gateway. In bound traffic can be protected with any of the following security techniques. Outbound traffic can be protected with following techniques.. Being part of the WSO2 Security team for years now, it's so natural to think, how we meet these criteria with WSO2 Product Stack..? In fact we do already... Only thing we lack is the full support for WS-Federation. Even a set of students from University of Moratuwa - currently working on adding WS-Federation support for Rampart - which is the security module of Axis2. To be more precise - we have already done this at some of our customers. Let me briefly share some of my experience with a customer who is highly concerned about security. They had the backend services already implemented with WCF and protected with Integrated Windows Authentication[IWA] - hosted in IIS. They have three types of clients who need access to the BE services. Windows client doesn't have any issues in accessing the BE services - with IWA. C++ client had some technical challenges. It is already developed and only way it supports securing the communication channel to the BE services is through BasicAuthentication. Third party client can be developed on any platform. The challenge is - we do not know how to authenticate users who are coming from a different domain - and they also need to integrate with internal windows authentication. Apart from this - we also need to authorize each and every user. Let me summarize the requirements..
We need to do a credential conversion from BasicAuthentication to Kerberos and WS-Trust to Kerberos. Apart from this we need to have an authorization scheme as well. Let me explain our solution. We decided to have WSO2 ESB - acting as a security gateway - implementing the message interceptor gateway pattern. Also - we decided not to propagate end user credentials to the BE services. 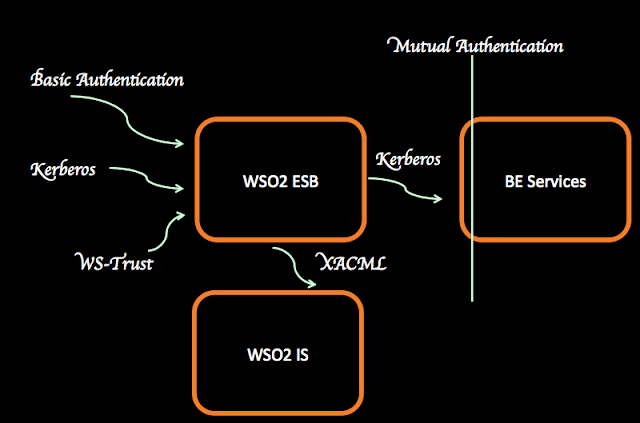 It's up to the ESB to authenticate and authorize users and occupy the trusted sub system pattern to authenticate to the BE with Kerberos. The above gives us a unified authentication and authorization scheme across three different clients. It's true that with this pattern we do not pass user credentials to the BE services. But, still we need to send the user name corresponding to the request to the BE. In that case we wrote a mediator to extract the user name from the incoming request and attach it to the out going message form the ESB to the BE services. Okay.. one last question.. It's clear that we can define an authorization scheme for internal users - based on their roles.. But.. how do we authorize third party users..? All the requests [based on WS-trust] are signed by the corresponding STS. So - with the signature - we can identify to who a particular user belongs to. Internally we define roles for each and every partner and once via the signature we identified the partner, we can easily figure out the mapped role that particular user belongs to. The XACML policy authorizes the user against this role. I guess that's pretty much the solution to that specific problem - although in my description I do not cover how to govern both the security policies and XACML policies - which should also be part of a Security Gateway Solution. If you are further interested in reading about more features that you should look into, while building a Security Gateway - it's highly recommended that you go through Security Gateway Buyer's Guide. View more presentations from Robert MacLean. Catch who removed you from Facebook...! Facebook doesn't send notifications upon unfriending.. although it does when somebody added you. This blog post explains how to catch people who remove you from Facebook friend list. Before running the following java program, you need to do the following steps..
0. Go to http://www.facebook.com/#!/pages/Facebook-Developer/7213347185 and LIKE that page. 1. Go to http://www.facebook.com/developers and click on "Set Up New App"
2. Once done with  - go to the link http://developers.facebook.com/docs/reference/rest/auth.createtoken and select your application from the "Test Console" and click on the link which looks like https://api.facebook.com/method/auth.createToken? 3. Now a new browser window will be opened up and from the Url - copy the access_token - which is in the query string. Make sure you properly copy the access_token value only - don't mess up with the other query string parameters present in the same Url. 4. Replace the value of the constant ACCESS_TOKEN in code below with the one you got from . 5. Download the RestFB jar from here and add it to the classpath of the java program. 6. That's it and whenever you run the following program you will see the friends you made and lost from your previous run. SSLStrip tool provides a demonstration of the HTTPS stripping attacks - you can download it from here. Then on OS X 10.6.5 with MacPorts we need to install following dependancies. Now, run the following from the SSLStrip home directory. Now starts the interesting part.. We need to make the traffic from our target machine goes through SSLStrip. To do that first we need to make sure the traffic flows through our machine. That we can do by ARP poisoning target machine. My previous blog post explains how to do that. Once that is done - we need to forward all that incoming traffic to port where SSLStrip running. Enable IP forwarding on MAC. Now we need to add a rule to IPFW to redirect traffic to the port SSLStrip is running. To install dsniff on MAC OS X - with MacPorts. Download and launch Apache Axis2 - it comes with a sample web service which is by default available at http://localhost:8080/axis2/services/Version - we will be using this as the service to write our JAX-WS client. The Java API for XML Web Services (JAX-WS) is a Java programming language API for creating web services. It is part of the Java EE platform from Sun Microsystems. Like the other Java EE APIs, JAX-WS uses annotations, introduced in Java SE 5, to simplify the development and deployment of web service clients and endpoints.The Reference Implementation of JAX-WS is developed as an open source project and is part of project GlassFish. First we need to generate the Stub classes for the service we are going to invoke. This can be done using the wsimport tool. The tool is available at [JAVA_HOME]\bin distribution. The above resulted with the following error. [ERROR] A class/interface with the same name "wso2.Exception" is already in use. Use a class customization to resolve this conflict. Following is the client code - and you need to have version-stub.jar, which was generated in the previous step. Download and launch Apache Axis2 - it comes with a sample web service which is by default available at http://localhost:8080/axis2/services/Version - we will be using this as the service to write our JAX-RPC client. JAX-RPC is intended to be a Java API to expose remote procedure calls that use XML to business applications and it facilitates the invocation of remote procedures using XML as the data format and SOAP as the data protocol. The overhead in developing JAX-RPC clients is minimal since the API it self abstracts and hides the low level SOAP semantics associated with RPC from applications. Although Axis [version - 1] had support for JAX-RPC - Axis2 does not. Axis2 has the support for JAX-WS - JAX-WS 2.0 is the successor of JAX-RPC 1.1 - the Java API for XML-based Web services. If possible, JAX-WS should be used instead as it is based on the most recent industry standards. First we need to generate the Stub classes for the service we are going to invoke. This can be done using the wscompile tool. The tool is available with the GlassFish distribution. Now lets generate the stubs with the wscompile tool. JAX-WS still supports SOAP 1.1 over HTTP 1.1, so interoperability will not be affected. The same messages can still flow across the wire. JAX-WS still supports WSDL 1.1 so what you've learned about that specification is still useful. Java EE 5, the successor to J2EE 1.4, adds support for JAX-WS, but it also retains support for JAX-RPC, which could be confusing to today's web services novices. JAX-WS's data mapping model is JAXB. JAXB promises mappings for all XML schemas. JAX-WS's model makes use of new Java 5.0 features. JAX-WS's model introduces asynchronous functionality. JAX-WS, via JAXB, adds support for MTOM, the new attachment specification. Microsoft never bought into the SOAP with Attachments specification; but it appears that everyone supports MTOM, so attachment interoperability should become a reality. The handler model has changed quite a bit from JAX-RPC to JAX-WS.